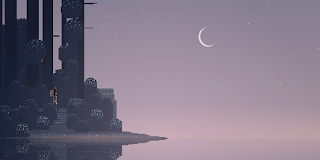 This week I wrote about my thoughts on Superbrothers: Sword & Sworcery. We're still in the relative lull of summer, so I feel like I can get away with playing a game for a second time. I actually find this phenomenon fascinating and more than a little disheartening. There is value to initial impressions and immediate feedback, but revisiting a work is crucial to understanding it. You might miss things the first time. Maybe your current life circumstances had a unique influence on your opinion? Historical context will almost certainly change your view; technology, politics, and culture are intertwined with each experience. It's unfortunate then that I (and many others) feel pressured to rush through games in an ongoing sprint to keep up with the times. To be fair, it's an embarrassment of riches; there are so many great, interesting games out there that it seems a shame to miss them. But it's also unfortunate that we miss out on the unique perspectives that come with more a more long-term study of a game. For example, I've read The Great Gatsby multiple times. I strongly disliked it the first time through, but something changed upon re-reading it. Or, more accurately, I changed. Now it has become one of my favorite books. Long term video game criticism is hit particularly hard for simple, practical reasons: it takes a long time to play a game. First you have to simply learn how to maneuver within their systems. Then, you have to get through the content, which can easily take dozens of hours. I could watch a film or read a book multiple times through in the same time I could play a video game and that's to say nothing about the necessity of jumping into multiplayer games early, before the community evaporates. All this is to say that I enjoyed playing Sword &; Sworcery again, even if I don't like everything about the game. "Long term video game criticism is hit particularly hard for simple, practical reasons: it takes a long time to play a game." As someone who pretends to write about video games, I feel like this is, at its core, the value I want to offer to readers. I don't claim to be smarter than anybody or necessarily more educated - I just spend a whole lot of time playing video games, and I hope to condense that experience into something digestible for other people. I think (or hope) there's real value in that. Not everybody has the interest, much less the time, to complete every game. To say nothing of re-playing sections, collecting screenshots, recording video, etc. There's no shortage of bloggers tossing out half-formed opinions on games (or TV shows or movies) they've spent the bare minimum time with. There is, I think, a shortage of people willing to really explore a work, or (gasp) write about a game more than a week after release. Don't get me wrong, there's room for both blogs and longer-form writing. But I agree with you that video games have a particular problem creating a proper balance between the game. I play fewer games in general these days, but I spend more time with the games I do play. I also replay more games, which I've found very rewarding. I still follow new games and buy plenty of games at launch. But at some point (probably after a Steam sale) I decided there's nothing wrong with focusing on what I want to play, rather than everything I can possibly play.